With Ken Griffey Jr. donning the cover of MLB The Show 17, Sony San Diego is honoring his video game legacy with a new Retro Mode. Shacknews went hands-on at PlayStation Experience to see just how this old-school experience feels. For MLB The Show 17, the franchise is looking to honor one of the most recognized Major League Baseball players of the previous generation: Ken Griffey Jr. This puts developer Sony San Diego in something of a unique situation. 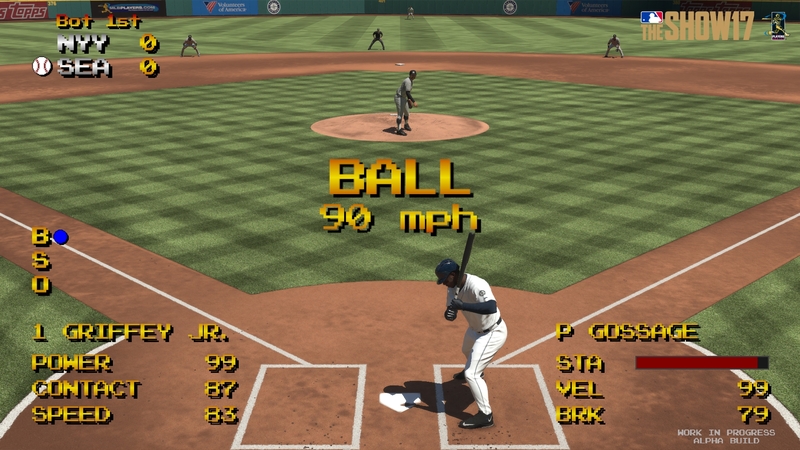 Griffey is not only one of the most beloved baseball players of the 90s, but he was also one of the faces of the sport in the video game world, as well. Fans of the 16-bit generation will remember Nintendo's first-party baseball games featuring Griffey as its cover athlete. Sony San Diego certainly does and that's why it has a little something special lined up for old-school Griffey fans. At PlayStation Experience, a new trailer for MLB The Show 17 ended with a look at a new Retro Mode. This new mode introduces a far-more minimalistic approach to The Show's modern simulation experience. Players don't have to worry about the ins-and-outs of managing pitchers and batters, but rather they simply start a game and jump right in. Does this honor the old Griffey legacy? Shacknews picked up a DualShock 4 at the event and gave it a look. Off the bat, it should be noted that Retro Mode is an interesting beast, in terms of visuals. The HUD, the pause menu, and many of the sound effects are pulled from console generations gone by, evoking that nostalgic feeling right away. But upon closer look, the stadiums and player models appear to carry a more modern, higher resolution. They certainly look like a visual upgrade from the 16-bit baseball days, so Retro Mode won't be a complete throwback in that sense. Where Retro Mode strolls down memory lane is with its simplified gameplay. There are no multiple pitch options when on the mound. Pitchers can slide across the mound and toss to the plate with a single button, with change-ups and fastballs controlled by holding up and down on the analog stick. Likewise, batters can move around the box and position themselves anywhere for their at-bat. Balls that are popped up into the air result in a retro-style ball graphic indicating where it'll fall to the ground. There's nothing more complicated than that, as these 6-inning sessions are about as basic as it gets. But in terms of crisp pitching and batting controls, simplicity works for the best here. That's not to say Retro Mode doesn't have a couple of issues, though. There are some moments where players might be reminded why baseball games needed to move forward. Base running and stealing is a headache here and it's fairly easy to get yourself caught in a rundown of your own making. There were a couple of instances where I'd hit a double into right field, but while my runner would round first, his teammate that was already on second decided to just camp there. So that's an out right there. Part of the joy of modern baseball titles is that base running has been refined to be a lot more user-friendly, but running the bases in Retro Mode is a throwback in the wrong way. There's also one other thing to note and that's that Retro Mode isn't messing around with its minimalist presentation. Don't look for any elaborate animations. And while that's to be expected, I was also shocked to see that there were no home run trots anywhere to be found. I did hit a few fastballs over the wall, but it would result in a "Home Run" text crawl and the game would immediately move on to the next batter. No rounding the bases, no celebration, no overhead view of the players crossing the plate. It's strictly no frills and it actually felt rather joyless. Retro Mode is in its early development stages, so there's still hope that a home run trot will eventually find its way into the final version. As it currently is, that feels like a big omission. Look for Retro Mode to take players into the past when MLB The Show 17 arrives on PlayStation 4 in time for the regular season.